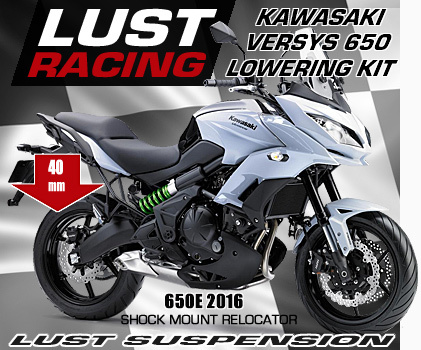 2012-2018 Kawasaki Versys 650 lowering kits by LUST Racing. Lowers the rear suspension. Rear shock mount relocator. By lowering the rear suspension the seat height is reduced. High quality lowering kit made in 6061-T651 aerospace aluminum. Powder coated black with LUST Racing logo in red and silver-chrome. Supplied with installation instructions. We offer lowering kits for Kawasaki Kawasaki Versys 650 from year model 2012 to 2015 and 2016 to present. 40mm / 1.6"inch lowering kit. 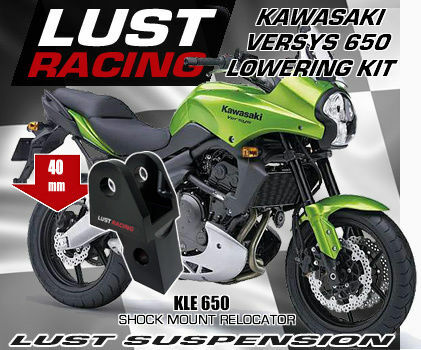 Lowering kits for Kawasaki Versys 650 A 2007-2015 and Versys 650 E/F 2016 to 2018 models by Lust Racing. This lowering kit relocates the lower shock mount and reduces the seat height by approximately 40mm (1.6"inches). NOTE: On E/F models 2015 the shock expansion chamber needs to be relocated. The expansion chamber bracket should be shortened or bent backward for clarance. The sidestand requires shortening, either cut or cut & weld.